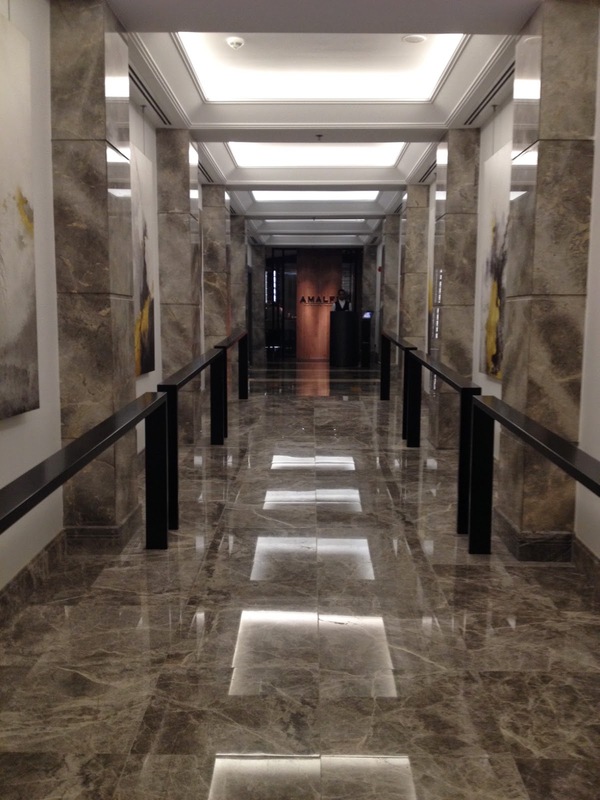 The narrow passage-way in itself is dramatic. 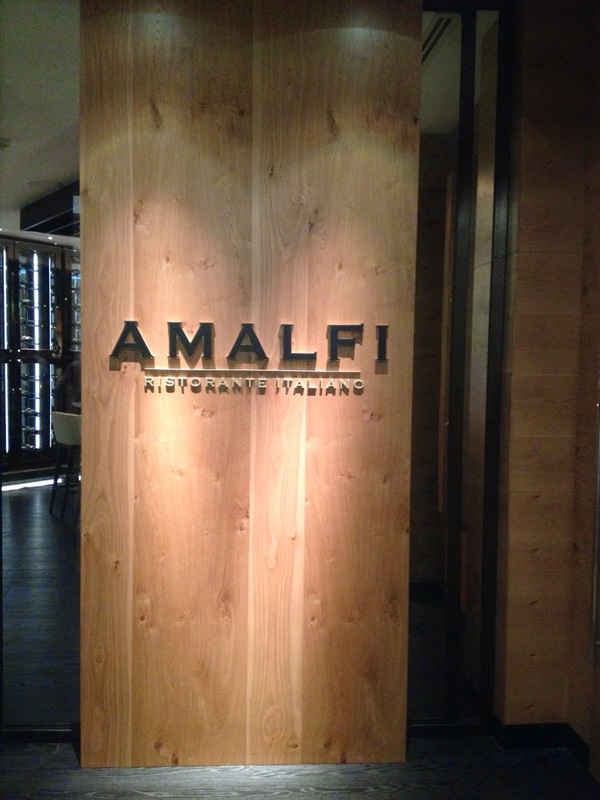 The name of the restaurant, simply written, stares at you as you enter; Amalfi - a town in the Campania region in Italy. The bar greets you. Apart from the name, there is nothing obviously Italian about the place, but then the signs hit you. You see the wine in lovely glass and stainless steel wine cabinets - Italian. 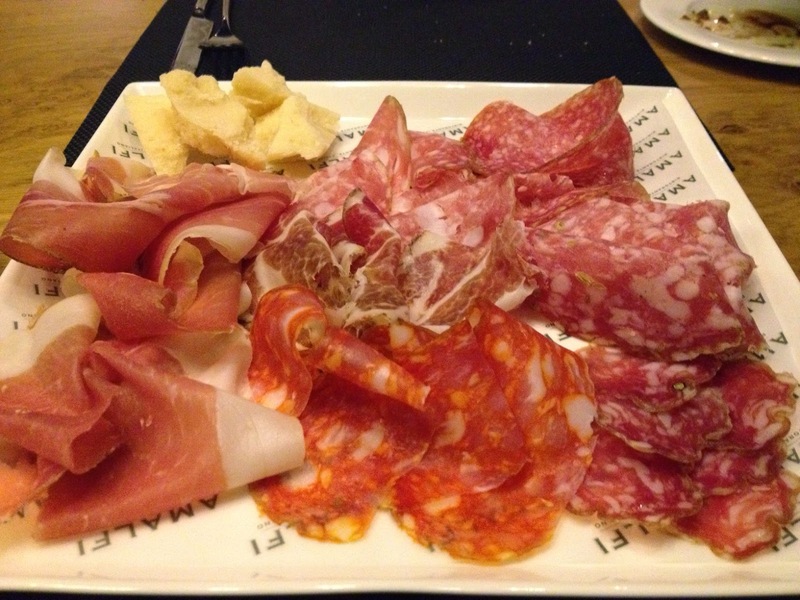 As I am lead to my seat, I pass a counter containing spicy salami, Parma ham, prosciutto, pancetta and a few other favourites - Italy. Definitely. Yes, this is the new Amalfi, where fine and simple Italian food is promised in an elegant setting. I love the passageway to the restaurant. Amalfi is all about an authentic Italian experience. For this reason, most of the ingredients are sourced from Italy. The puttanesca is superb. Hand-chopped anchovies, capers, tomatoes and olives. Yes, not put in a blender. In hand-chopping them, you can taste the individual flavours, and when you try it with the focaccia you can distinguish these tastes. Nice. Also, the 6 year old balsamic vinegar from Modena is rich, aromatic and everything. Oh the ham! Oh the ham! The ziti is delicious. Perfectly cooked and the meat, braised, just dissolves in your mouth. The ravioli does not quite reach the same heights because it lacks the same depth of taste and flavour as the ziti. An unfair comparison I guess. 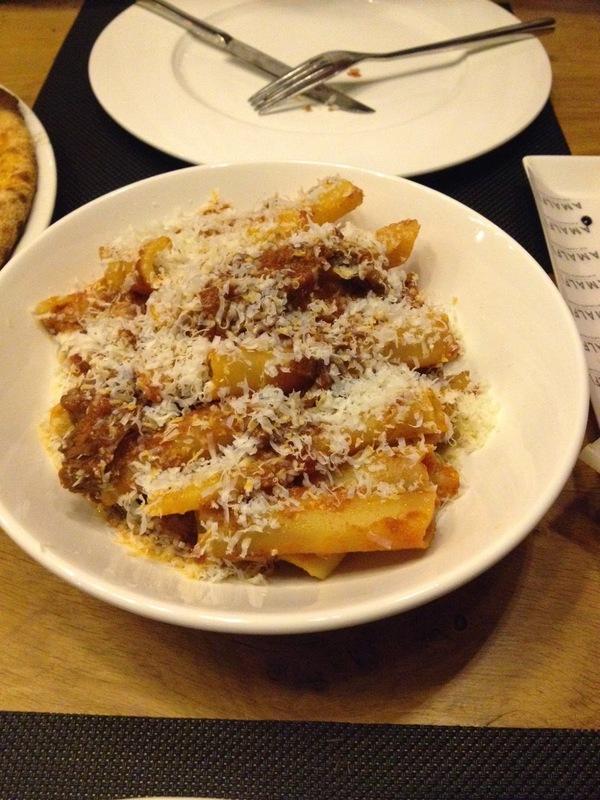 The bell pepper sauce too, is subtle too in contrast to the richness of the ziti. The pizza, on the other hand, is outstanding, and probably the best pizza I have had in Abu Dhabi. It is crispy without being hard. The porcini mushrooms and truffle make it rich and aromatic - and that is before you have even tasted it. Bite into it and the flavours overwhelm. 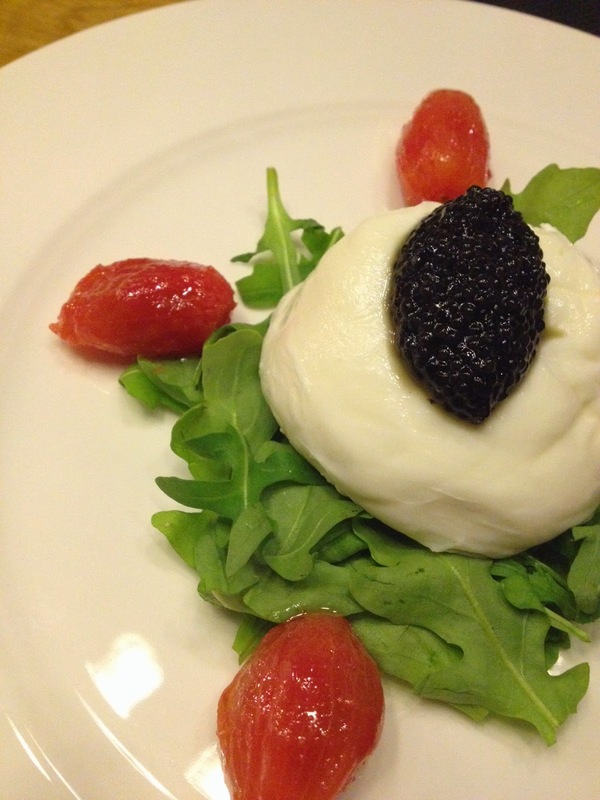 The absolute highlight for me though, is undoubtedly the burrata which is served with caviar (usually served with roe), has a simple almost rustic presentation. It is so dissonant with the ambience, decor, cutlery and china in Amalfi. There is a method to this. The buratta flown in from Bari, is of the best I have had. As I cut into it, the creaminess jumps at me. It is milky and creamy on the inside and firm and still flavorful on the outside. The caviar from northern Italy, a surprise inclusion, works really well. This dish is all about opposites, and if not opposites, then at least contrasts. It is a dish of colours. It was an experience in itself. No need for associations here. As to that method, here it is all about the home cooked meal experience with the trappings of a beautiful setting. People talk about liking a home cooked experience. But the truth is you are not going to pay 200 Dhs to eat a piece of lamb in your friend's kitchen are you? What you want is the experience of the home cooked feeling, but in a luxurious space. That is what Amalfi does so well. In the words of the executive chef Justin Galea, food is about triggering emotions. Part of the enjoyment is the association with a previous good experience, a time in one's youth for example. I put this to the test. On two occasions I experience what he has talked about. First, the lamb. rather than the ubiquitous Australian lamb, is Welsh lamb. I am surprised, but on reflection, it all makes sense: the climate in Wales with its heavy rainfall where grass feeding is more the norma than the exception. 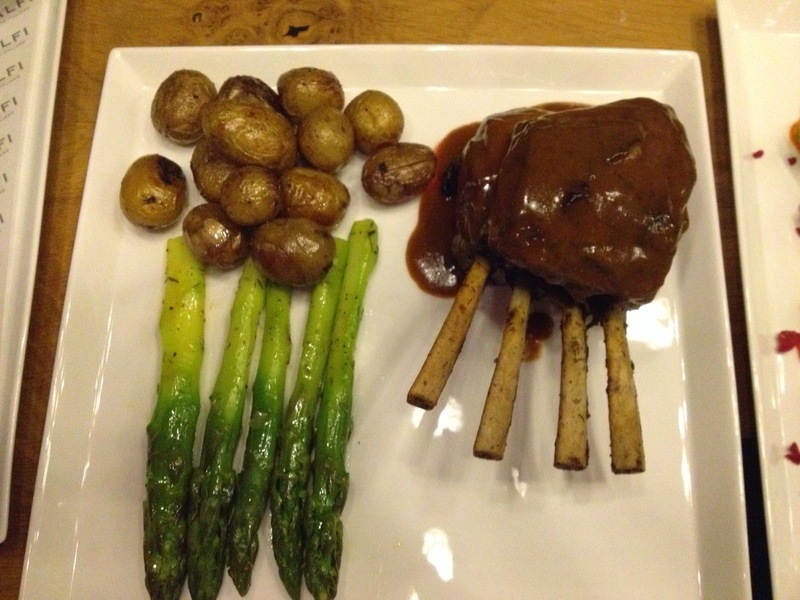 The lamb is served with asparagus and liquorice sauce! As I have a piece of lamb, I can taste the creamy fat in a mouthful that is full of flavour. Next, I try it with the sauce, and I get in that moment what their executive chef said about associations and experiences: As I eat it, I picture myself with a black piece of liquorice. It is a happy, carefree time. I picture my daughter having her first piece of liquorice. So, it was not just playing with language on the executive chef's part. I see the sincerity in his words. I feel the sincerity there. I get it. The corn fed chicken, good in its own right, comes of second best though and and pales in comparison to the outstanding lamb. They are different dishes with contrasting textures. 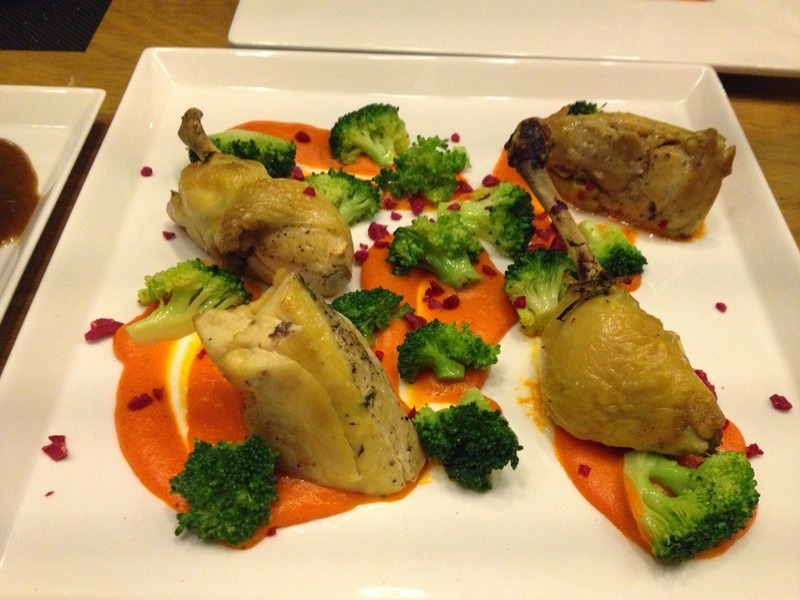 Next time, I will order this on its own because there it wen really well with the broccoli and sauce. 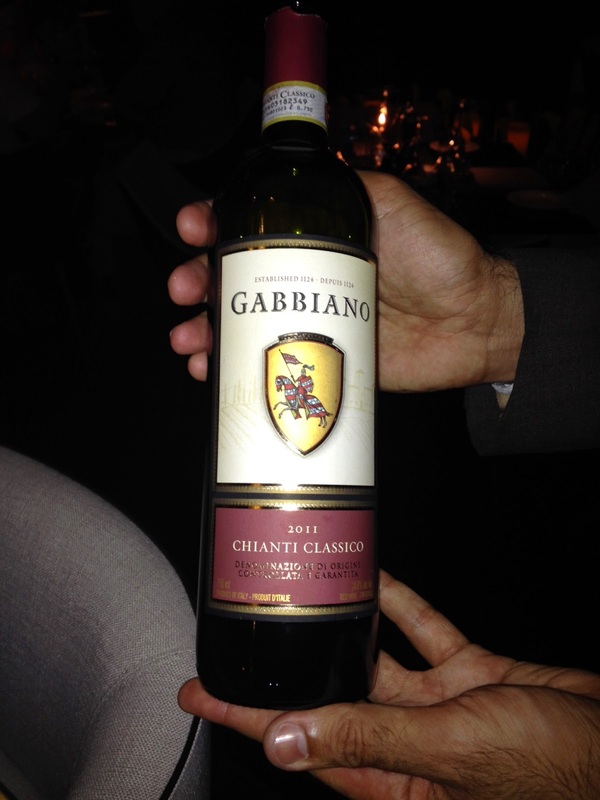 I enjoyed all of these fabulous with a lovely Chianti, a Gabbiano 2011. It is medium in body with a nice cherry colour. It is very dry with a hint of pepper. Easy to drink. Enjoyable. For dessert, Chef prepares a tiramisu. Of course; one of Italy's many sweet contribution to the culinary world. What he brings to my table leaves me with a puzzled look. Could it be? No. Surely not. But...wait, it is. Candy floss. It triggers the emotion. The second time. A warm, fuzzy feeling sweeps over me, as I sit in awe with the wonder of a child. Associations. 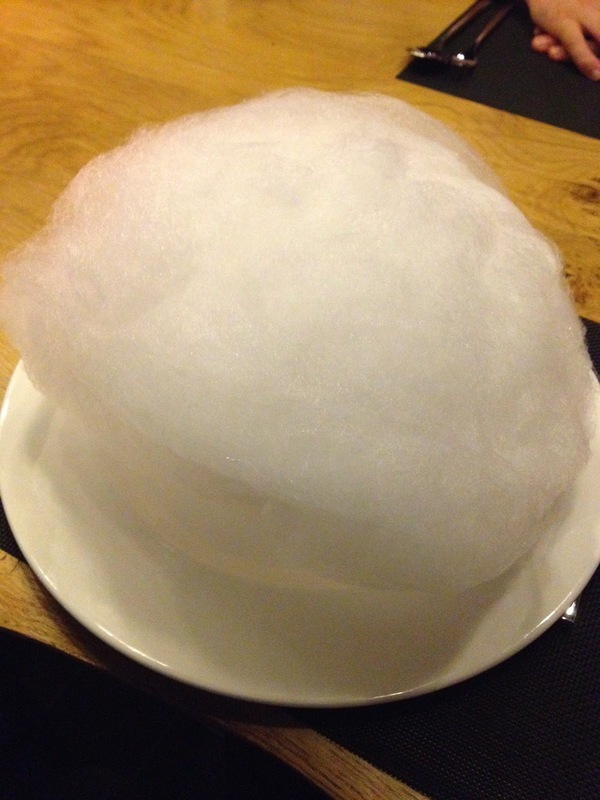 With my fingers I eat through the centre of the candy floss to reveal part of the tiramisu underneath. I eat away at more of the candy floss. Childhood. My daughter. Associations. 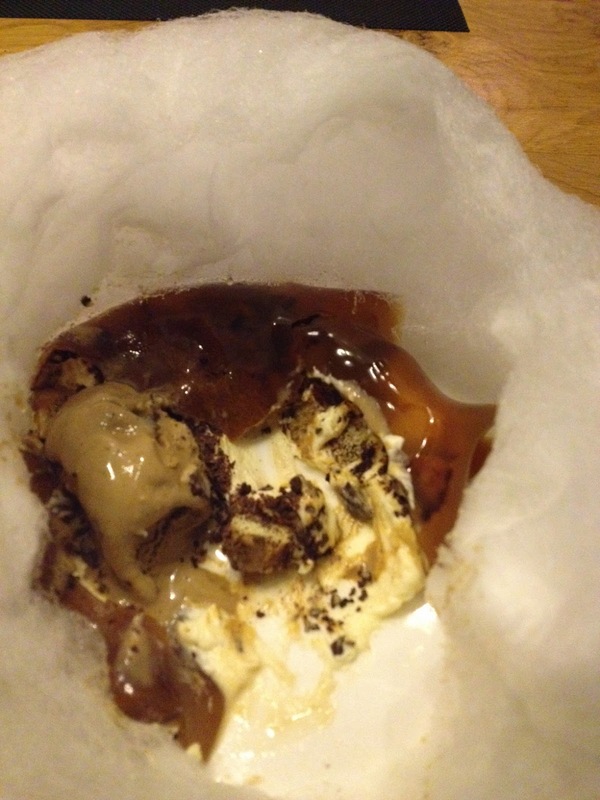 Next, I scoop up some of the espresso jelly that covers it. I get some of the chocolate ice cream. I get the mascarpone. I taste the crispy lady fingers. Nice. They are not soggy. I taste something else that is crunchy. Very dark chocolate grounds. Bitter, but beautiful. I taste the 76% pure chocolate. There is something else. Can't quite figure it out. I try them together, and I get the tiramisu in its full glory. I am beside myself. It is a tiramisu that is not overpowered by sweetness. I have another taste. Smooth and crunchy. No wonder it is called the creative tiramasu. A picture that does the taste no justice. The lemon sorbet too is wonderful. It is more lemony than sweet, and Chef gets the balance just right. There is nothing frilly about this dessert. It is simply good. Lemon sorbet in exquisite silver bowl and fine china. Amalfi, considering it has effectively been re-opened for well under 2 months, has done many things right in a that short time. But the service, while warm, is by no means flawless. We had to ask for clean plates on a couple of occasions, cutlery to be replaced and so on.On another note, the espresso 'cup' was too hot to hold - they need a more traditional 'holding cup'. Minor things, but nonetheless issues which can be worked on easily to ensure a near perfect but still soulful dinner experience. There is indeed plenty of the latter. However, Amalfi succeeded in the most essential ways - the food. In seeking out the best possible produce (mainly from Italy), and ensuring that it could well be on its way to becoming the darling of Italian food in the capital as it provides an authentic Italian dining experience. Chef Pascal, a Campania native, brings to the restaurant an in-your Mum's-kitchen feeling without the guest having to sit there. He seeks to to take diners to a small village somewhere on the Italian west coast where the taste is similar. He does not serve only food, he serves an experience - two things he does exceptionally well, making this one of the best Italian dining experiences I have had in the city.